The survey projects expectations for the 4th quarter of 2012. The scale ranges from 0-100 with 0 being much worse, 100 being much better, and 50 indicating no change expected. The professional Real Estate community’s optimism tempered across the board for the 4th quarter. The outlook for sales (yellow) this quarter is still showing improvement expected, from 58 to 52 this quarter, but not at the same pace as last quarter. This is 6 points higher than last year at this time. The expectations reflect a continued improvement in outlook when compared with the last two years in the 4th quarter. While all scores are down modestly except for price expectations, which still indicate modest declines in prices which improved from 48 to 49. Credit availability scores went from 48 to 45, still better than 4th quarter levels in prior years. The national score at 47, down from 49, last quarter, indicates that respondents are more pessimistic about the overall economic picture. The participants remained positive on the statewide conditions at 53 down 4 points from last quarter. Sales expectations are slightly positive at 52, down 6 points from last quarter. Inventory expectations remained at 52 indicating continued improving conditions expected. Sellers are likely to be frustrated by pricing, and buyers will continue to have problems getting financing. The coastal region continued to remain the most optimistic in the state. On an overall basis all areas remain above 50, indicating expansion expected. This quarter showed deterioration in all measures and in all regions. This is a seasonal phenomena. None the less the results are still encouraging, with most measures still in the expansion zone, over 50, and well above prior year 4th quarter indications. 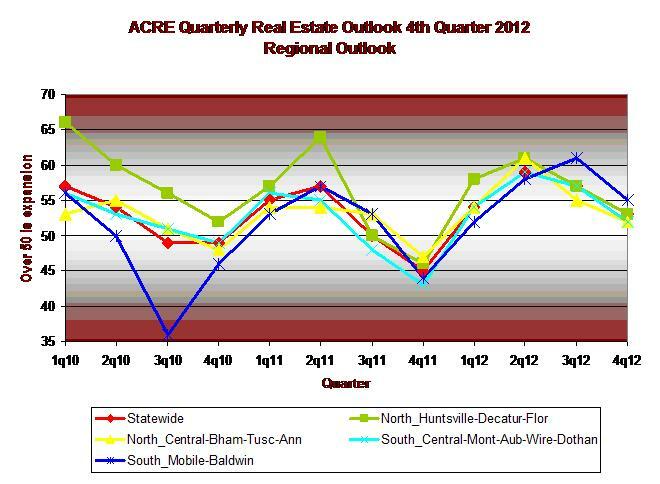 Commercial market participants (the majority of the respondents are from the Birmingham market area) moved to projecting a neutral market this quarter (Total Stat) at 50 this quarter vs. 52 and 52 vs. 52 last quarter for sales expectations. Price expectations are still soft, at 49 vs. 47 last quarter indicating pricing pressure. 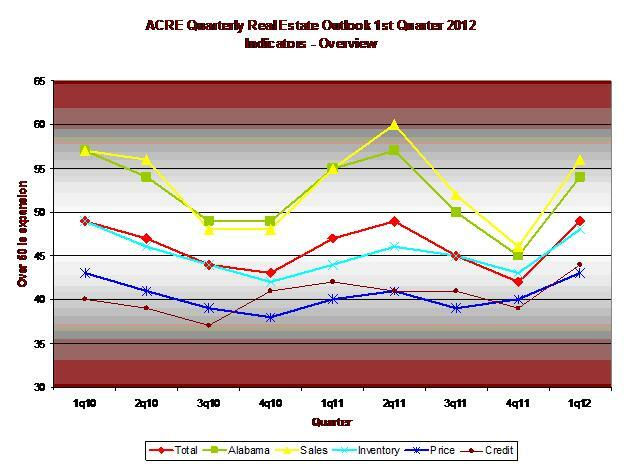 The score for credit availability remains constructive, at 49 down from 51 points from last quarter. North Alabama experienced a modest deterioration in most scores. The total score of 49, down from 51, a 2 point decline from last quarter, but as with the other areas, still well ahead of prior year 4th quarter scores.. 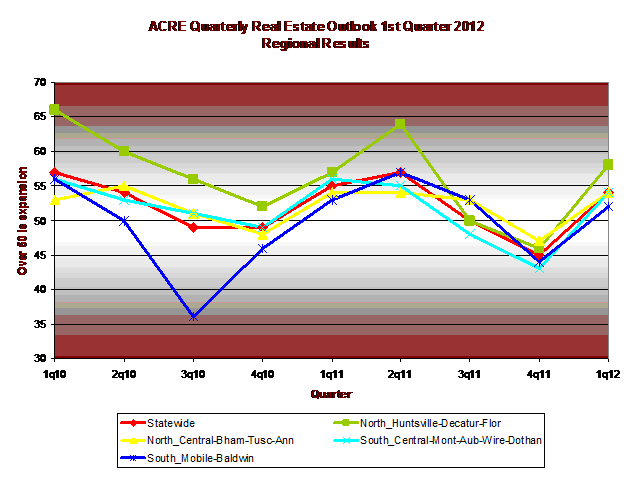 The North Central Region overall score declined to 49 from 51 last quarter, The sales score declined 4 points to 51. Inventory is continuing to improve at 52 with, pricing, and credit below the 50 mark with pricing at 48 and credit at 47. The South Central Region participants outlook for sales declined 6 points to 50. The Southern Region sales score declined 8 points to 55. Rural participants sales expectations declined 12 points to 51. 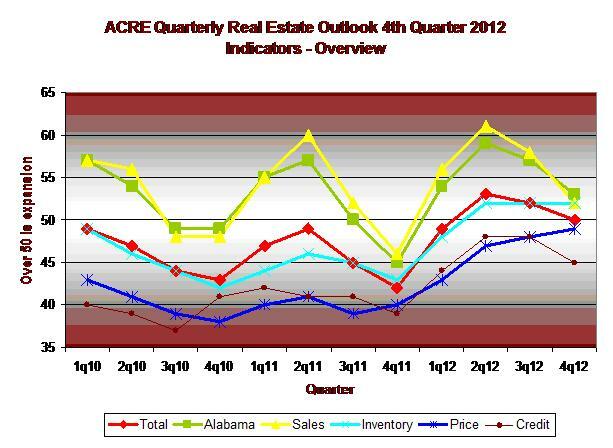 This entry was posted in ACRE, Alabama Center for Real Estate, Alabama Real Estate Confidence Index, Forecast, Inventory, real estate and tagged Alabama, price expectations, real estate, statewide conditions on October 16, 2012 by Tom Brander.